(M) See I had asked forgiveness for fears, self-hatred, anxiety; I’d asked for that forgiveness for me, but I have never broken the curse by the blood of the Lamb. So, He wanted the curse broken, and He wanted me to enter in to it, to experience something, because we as a Body have been asking for some things from the Lord in these end-times, and one of them is healing. We have many healings in our midst. But I’m really desperately asking for a ministry of physical healing. Well, you can admire a parent for things God condemns. (M) He calls everything the flesh does as heinous sin, even if it’s goodness. (M) And we’ve learned you cannot admire what is ‘good’, because there is no good. (M) God calls goodness the arrogance to think that you are, are good, or that you can be or that you should be. Even Jesus said, “Why call ye Me good? There’s none good save One, the Father.” So, it eliminates all goodness of humanity. And we are absolutely certain God is going to heal me because I am healed. It’s the breaking of the curse and the understanding of it that He’s after. But the generational curse is unconfessed sins. It’s the failure to repent, to seek God for the sin; it’s leaving the sins intact and under the law so that they’re operative in the life of the children. That’s our choice; that’s not, that’s not Gods’ fault. But it leaves each one of us totally responsible for it. And what I’ve seen is, what you have as a generational curse, the unconfessed sins of your ancestors, becomes a normal way of life. You tolerate a lot of things under a generational inheritance. But do you see, John, where we’re going is… We continue by choice the sins of the fathers. So we tolerate those sins. This must be how humanity has to live. No, God wants us to be entirely free, with every yoke broken. And this constitutes for me, a yoke. So you can fight against a generational sin, an inherited sin, but you can never overcome it until you break the curse that comes down. So, you said… you put in the word ‘now’, so far as I knew I had forgiven, so far as I had light I had forgiven. Now I understand what there is to forgive. (M) And the fact is you suffer a lot because of your parents. I’m sorry, that is this fallen condition that God comes in to rescue. And so, the work has been to see what the inherited sin is. Well, I know its fear, anxiety, self-hatred and guilt; the absence of the blood in other words. The blood cleanses, the blood transforms; the blood of Christ is the only answer to sin. But the real issue that He’s bringing me to is independence. (M) When you take everything down to its bottom line, it is the independence of Eden. Adam and Eve chose to be independent of God because they wanted to control. And so, the Lord’s not dealing with me about those four named sins. All of them are about independence of God and control. And it’s like those things keep you from receiving from God, because you have to do it. (J) Say ‘how;’ how does fear constitute control? How does self-hatred constitute … you know, anxiety, how is all that control? (M) Ok, Adam and Eve chose independence. They said… they chose actually satanic independence, which is not only ‘I can do it’ God, but ‘I am better than You at doing it’. And the immediate result was that they hid themselves and were afraid. So fear is evidence of the independence of God. And He took… in dealing with me about it He just didn’t deal with the little four names. He dealt with the core, which is control; I’ve got to be good, I’ve got to do ‘this’, I’ve got to endure. Things that you admire, that I admire in my parents. I’ve got to work, I’ve got to achieve. They weren’t achievers on a big grand scale; they just were responsible, and for a simple life. But those things that I admired are those things that God has shown me He does not admire, because they remove Him. And that’s why there was no blood. (M) Redemption that was passed down to me. I’ve said the greatest thing you can do for your children is repent and obey, because you can break the curses from your own sin for your children by the blood of Christ. So, it’s independence is ‘I can do it, thank You very much God’. But then you’re left in the complete inability to do what only God can do. You can’t do anything. Jesus said, “I can do nothing.” So what it, what it is… it left me ever with the effort, and that ‘effort’ is control. He showed me the three temptations of Jesus were the temptation to control. I’ve said before it was the temptation to pick up power. But what is it to pick up power? More, more earthy clear word would be the temptation to control. (J) So it’s a human nature thing. If you’re saying it’s Adam and Eve, it’s a thing that’s our nature. (M) It’s our fallen nature. (J) Correct, our, our old man. (M) We weren’t created to be that independent. We were created with a choice between God and Satan. We were created with freedom, absolute freedom. And Adam and Eve chose to be independent of God. They chose to take the control of knowing everything into themselves, which is the temptation. The subtle hidden temptation was, “Come on and just, you be God.” That’s why He said in Genesis “They will be gods.” It didn’t mean they really would. It meant they would presume they were God and live as if they were God. And, and assume they were God. And that sin is in every person. Have you got something Carole? Come on. (Carole) Well I just saw again that if Satan… When you said this is Satan, what Satan does… if Satan can do this then we immediately become the vehicle for his demons to ourselves and to everyone around us. And I know this is a fact because I have done it, and seen the horrible results. And because I finally saw the results of not just, not just what we consider our benign choice to, to fear, to control, excuse me. To control, we think that is benign, we think that is great in a lot of situations, what we should do. But when He showed me that when I do that I become the vehicle, no longer for the Holy Spirit, but I immediately become the vehicle for Satan. And when Satan has won that battle in me, then he is free to set his demons loose to ah, to destroy, to wreak havoc, to create an atmosphere of hysteria and non-peace. (J) Are you saying to bring torment to those around you? (Carole) To bring torment to those around me, absolutely, and I’ve seen it, I’ve seen it. (M) To those that we want to control. (M) Ok. And that’s, that is the typical human condition. And you see Jesus would not control anybody. We are… we are born to control from the womb, we are born being controlled, and as parents we use control; and we have to, we have to lead and rule. So we really know nothing about how to live without controlling ourselves, without attempting to control others. And the… we have no consciousness of a life free of control so that God has all control. (Carole) And it’s not just controlling people. It is controlling the circumstances around you. (J) And ultimately God, right? (Carole) Yes, and ultimately God. (M) See the three temptations were control matter, turn the stones into bread; control things, money, things; get things for yourself whether God gives them or not, that’s control; then, jump off the parapet and force God’s hand, get God to… get control, let God do what you want Him to do, control God. And I’ve seen how we do that. We say, “ok, I’ll do this, so You will have to do that God.” I’ve done that, and I’ve seen that preached in essence. You do this, and God has to do that because He promised. God doesn’t have to do anything. You cannot control Him, and He will resist everyplace where you manipulate to control Him, rather than as I read this morning in Psalm six; David said ‘Heal me for Your sake, my soul and my body are in great distress, heal me because of Your lovingkindess’. David wasn’t trying to control God, he was appealing to God; and then in the same Psalm he says, ‘God has heard my prayer, depart from me my enemies, God has answered me’. (J) So like if I say, oh, if I praise He’s going to come and His presence, or if I, if I get up early and I do a quiet time, that means He has to speak to me and He has to… is that what you’re talking about? (M) It’s a mind-set. I though this morning… I didn’t feel well and I thought, I need to praise Him, and then I realized that I was going to praise Him so I’d feel better. (John laughs) And that’s control of God. It is so ‘in us’; it is so in that nature, that’s the motive. Well we can get into how to be parents, but I don’t want to go there quite yet. I want to share a verse that has been mine for many years, but it has a new relevance. It’s 1 Peter 1, starting in … I’ll just say 16, 15-16 in the Amplified. “But as the One Who called you is holy, you yourselves must also be holy in all your conduct and manner of living. For it is written, You shall be holy, for I am holy.” See, we have inherited… this is really about inheritance. Which inheritance are you going to have? If you choose to hate or love your parents, you’ve made them an idol. You will inherit everything, everything. But if you will leave parents in the right way, by the Spirit, you will have your inheritance in God, which is holiness. And everything, all spiritual blessings in heaven are yours in Christ Jesus. The whole… the Bible is big on inheritance. And if we continue on this train, then I’ve got a lot more to share. But let me read this verse 17. “You should conduct yourselves with true reverence throughout the time of your temporary residence on earth.” Verse 18, “You must know, recognize that you were redeemed, ransomed, from the useless, fruitless way of living inherited by tradition from your forefathers, not with corruptible things such as silver and gold, but you were purchased with the precious blood of Christ, the Messiah, like that of a sacrificial lamb without blemish or spot.” So that’s our… that is the promise. Our redemption includes being redeemed from the useless, fruitless traditions of our forefathers. And everybody’s got those. (M) And we pass them on unless we take the redemption from everything that forefathers had that is in us. This gene of gluten intolerance is in me. That I inherited. To me, it’s God’s way of bringing about for me, this message. Someone said, “ Martha, ‘death is working in you that life might work in others’” And I do believe that. It’s not that it’s easy, but this is about inheritance. If you don’t inherit this gene you will never have this disease. And so it says that your body literally is transformed by what you confess as sin, and what you receive the blood for. And we know that. And by blessing, by your parents blessing on your body or your blessing God for the body He gave you. That changes literally your DNA. When faced with turmoil on all fronts, there is a power available to the Body of Christ. The church must rise in fullness to manifest the presence of Christ in this crucial hour. 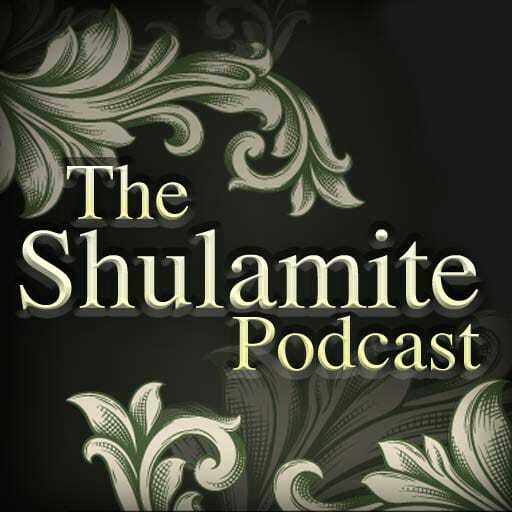 We at Shulamite Ministries want to invite you to join us for the sequel to our May conference. In “The Coming One” conference, Martha gave a message of hope and preparation for times of trouble and crisis. Martha’s current burden is specific to the authority of the transcendent church, the Body of Christ, not limited by time or location. So come fellowship with us in Atlanta, Georgia, October 23rd through the 25th, and partake of Christ’s heart to make His Bride ready.